Yesterday I went to a small concert with an afternoon tea party with my family and some friends. It was held at Yama-no-hall in Nisshin. There is a tea company named M&P’S TEA in Nagoya and they sometimes have concerts and tea parties. You can enjoy the music and after the concert you can taste many different kinds of tea and delicious their handmade cucumber sandwiches, scones and other sweets. I often join in their Tea Concert. The singer’s voice was very nice and strong and I enjoyed her songs. After the concert, I had my favorite Paul’s cucumber sandwiches and Rie-san’s homemade cakes. All of them were great! And I met many people and enjoyed talking with them. I had a really good time! Last Thursday I was in Tokyo. I attended a Buddhist ceremony with my relatives. I had to leave my home at 5:40 in the morning! Too early for me! Anyway, I had some interesting experiences there since I seldom join in Buddhist rituals and visit temples and the grave. As I said, I seldom join in Buddhist rituals and I didn’t know what to do in my turn at the ceremony. That’s why I had to watch what other attendances were doing carefully. But it seems that others didn’t know exactly what to do as well…I was relieved. Anyway, I was able to observe the Buddhist priest’s action interestingly. After that, they served an iced tofu, a kind of tofu pudding, deep-flied dried soy milk skins. Oh, they were delicious. Very crispy! I love pork. I like bacons, ham and sausage! I went to a stockbreeding institute in Oakazaki City last Monday. A friend of mine got some information that you can study through actual experience of making ham and sausage there. That’s why I went there to learn how to make sausage with the friend and our other friends. We prepared 6 kg of minced pork for making sausage. We decided to make plain one and basil one. First we weighed and divided the mincemeat into two, and kneaded it adding water and seasoning. After that we added some fat for nice texture. You know, you can enjoy crisps when you eat. But it was slight difficult to mix the mincemeat and the fat. I mean we had to strew it all over and be careful to not to crush it. That was my first time to see and touch long tubes of in the body of sheep! Since they were preserved in salt, we had to disentangle and rinse them in the water. And then, we passed them through some plastic tubes. After put the seasoned and kneaded mincemeat into the machine, we started stuffing it into the long tubes of skin, and then made it sausage shapes. Oh! They look sausage! Look! We’ve got sausage! They look delicious, don’t they? Yeah, they were indeed! 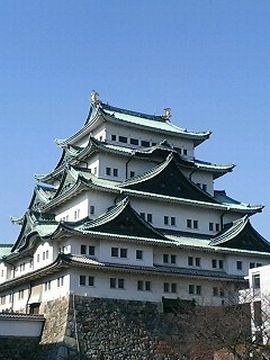 This is Tenshukaku, or the castle tower, in Nagoya Castle. It was originally used as a watchtower and a command headquarters in domestic wartime, not for living. You may have thought the lord and his family lived there, but they lived in another place called Ninomaru-Palace. The castle tower is excellent architecturally. usually the upper floor is smaller than the lower one. But, look at the photo. The first floor and the second floor are the same size. So, it had enough space to store weapons, food, and water and so on in wartime. Whenever I come to the castle, I’m impressed by the beauty and the strength of the tower. Probably people who lived in the 17th, 18th, and 19th centuries might have felt the power of the lord when they looked up at the castle tower as well. Now, look at the top of the building. You see the shining golden fish-shape objects there. They are called Shachihoko, a lucky charm. Shachihoko is often shortened to Shachi and those are usually called Kinshachi. Kin means golden in Japanese. They’re beautiful, aren’t they? They’re covered with 18 carat gold. A total of 88 kg of gold was used for both Shachihoko. I think the value of the gold is around 150 million yen or over 1 million dollars now. Shachihoko is a kind of imaginary creature with a tiger head and a fish body. In the old days, it was believed to live in water and splash water when there was a fire. 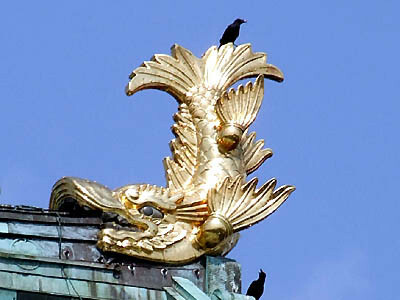 That’s why those Shachihoko were fixed on top of the roof to protect the castle tower from fire. You’ll find the same kind of lucky charms in other old Japanese buildings as well. 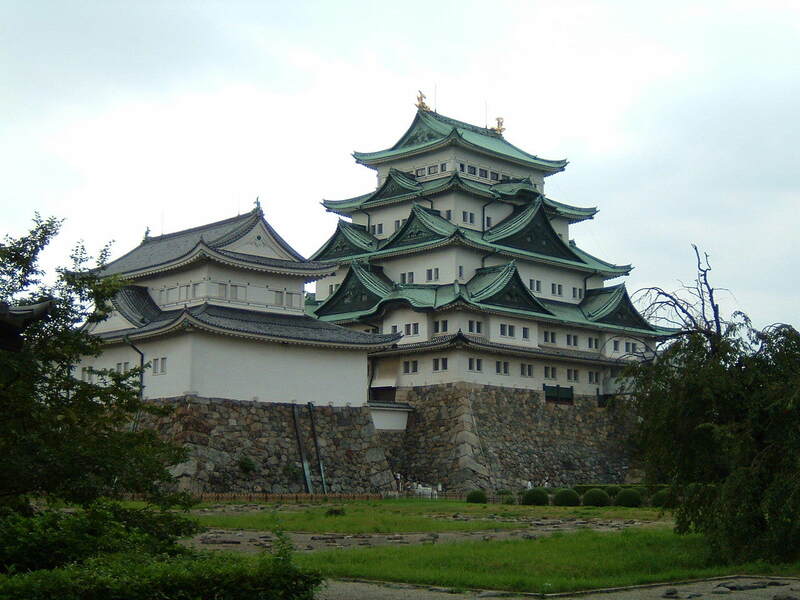 Unfortunately, the original castle tower and its Shachihoko were burned to ashes by the fires of war in 1945. It seems Shachihoko’s magical power sometimes doesn’t work. But Shachihoko is trying to protect us from fire still now. 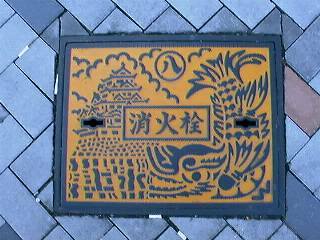 You’ll find its figure on the lids of fire hydrants in Nagoya city. Nagoya is a sister city to Los Angles and Mexico City. I attended a ceremonial party of those sister cities last Tuesday. It was held at Nagoya International Center. It was raining hard, however, many people gathered there. After usual formal speeches, many performances started…First Japanese senior citizens in beautiful kimono danced. They looked very cute! I think all of them are over 70 years old, but they were really energetic and vigorous! Two boys and two girls from Los Angles attended the party as exchange students. One of the boys sang an old Elvis Presley song in sunglasses. While he was singing, Japanese girls and Mexican girls were really excited. That was interesting. But I think both of them are really Japanese because their dances were unified. I mean no one danced freely. You know, in Japanese society, harmony is most important. Interestingly, American and Mexican girls looked kind of bored while Japanese girls were dancing, but in the meantime Japanese, American and Mexican boys and men looked really excited! The traditional dances by Mexican students were splendid. Their costumes were very beautiful. After their performances, the boys threw their hats to Japanese girls and the girls also threw their floral accessories to them. That made the party warm up. Since there were many kinds of foods and drinks in the hall, and a Mexican chef came there to serve tacos, all of the participants were enjoying the performances and the food. Unfortunately I didn’t have any opportunities to talk other participants at all since the event was almost for seeing the performances. But I had a good time there and the taco was very nice! The movement of tai chi chuan looks like an elegant dance. It’s very beautiful, graceful and well-balanced. When you do tai chi chuan, you shouldn’t strain yourself. You have to practice tai chi chuan everyday and the continual efforts make your movement artistic. 1. If you have calm mind and your body is flexible, you’ll be able to cope with any problems. Many people have become calm and deliberate after starting learning tai chi chuan. People’s temperament changes when they become healthy. 2. Everyone has own treasure in each mind. Some doesn’t realize to have them. And some are hiding them inside. Tai chi chuan helps you to find what your treasure is and makes you happier with it. 3. When you do tai chi chuan, you should have calm mind, relax, and breathe slowly. Then your autonomic nerves work properly. 4. If you can thank to God, people, and everything, you won’t have bad feelings. When you do tai chi chuan, you should pray everyone’s health and happiness. There, you have calm mind and your anger or sadness disappear without notice. One day, I was upset when someone misunderstood me. I tried to clear up the misunderstanding and gave a phone call to the person. But he wasn’t there. So I was going to try to call later and started practicing tai chi chuan with my friends. I noticed, however, that I had dwelled on a small thing, and stopped calling after the practice. 5. We should eat and move properly everyday for our health. Everyone knows that. But it’s more important to have calm mind. Impatience, anger, hatred, and all negative feelings interfere with your health. When you do tai chi chuan, leave everything up to God or the universe. Then you can move naturally. 6. Don’t you think people whose faces look bright have good posture? Yes, improving your posture is very important for your health. If you try to keep good posture, you’ll become positive and healthy. 7. Living is moving your body. Moving your body is a tip for your health. Do you know there’re three ways for curing sickness? The first one is using medicine; the second one is bringing out your self-healing power in you, and the third one is trying not to cure. Maybe the third one is difficult to understand. It means to believe something. And tai chi chuan is the third one itself. So believe this. Tai chi chuan makes you healthy and happy. Actually, Mr. Yang Ming Shih wrote more in his book. I just picked some up from it. But I think his main points are doing tai chi chuan breathing slowly with calm mind for your health and happiness. His words heal my mind. But am I living up to his philosophy? Noooooooo! I can understand his ideas and they’re really wonderful! But you know, doing something practically is difficult even if you know it’s very good for yourself. Actually, I’ve been dwelling on something recently. I’m now trying to drive it away from my mind, but it doesn’t work well. I’m disappointed and have lost confidence. I can feel happy some time a day though. Ahh…OK. I’ll do tai chi chuan more! For myself and for people who I love! 6. If once you start moving your body, you should be lightly and lively. The most important thing is that you should concentrate your spirit into your spine and stand up with a straight back. 7. I concentrate my attention on my soles when I go down the stairs or a slope. If you lose your step or slip, it’s because that you don’t think anything about your soles when you walk. In tai chi chuan, we consider feet are very important. Your energy is born from your sole and it goes up through your legs and to your hip. In both of martial arts and dances, the pivot of the movement is your hip. And the beauty of your fingers results from the movement which starts at your soles and goes through your legs and hips. 8. If you are complaining that you are not given something, it’s because you are not calling for it. Stop mourning over your unhappiness, start looking for your happiness. 9. How many worries we have! No one want to be unhappy though…Yes, we human being is too week to overcome difficulties. But you can fill with happy feelings your mind, and it makes you forget your worries. Breathe slowly and do tai chi chuan with calm mind, and hope your happiness. 10. Who cures you is yourself. Of course, doctors will help you. But can they loosen your body up? Can they calm your mind? Or can medicines do that? No, they can’t. Only you can. You have to calm yourself down and try to forget all worries. Breathe slowly and move your body. You’ll be able to keep you healthy. 11. A leaf, it’s beautiful. But leafy trees give us a pleasant place. We human being is the same. Each person is a treasure. Everyone wants to be happy, but you know, it’s impossible that only you are happy. It’s important to hope not only oneself but also other people’s health and happiness. 12. If you get sick, you should breathe slowly, try to ease your tiredness physically and mentally, have a good rest, and have nutritious food moderately. You have self-healing power. You should try to draw your own power out. Even if the medicine is great, what cures you is yourself not the medicine.